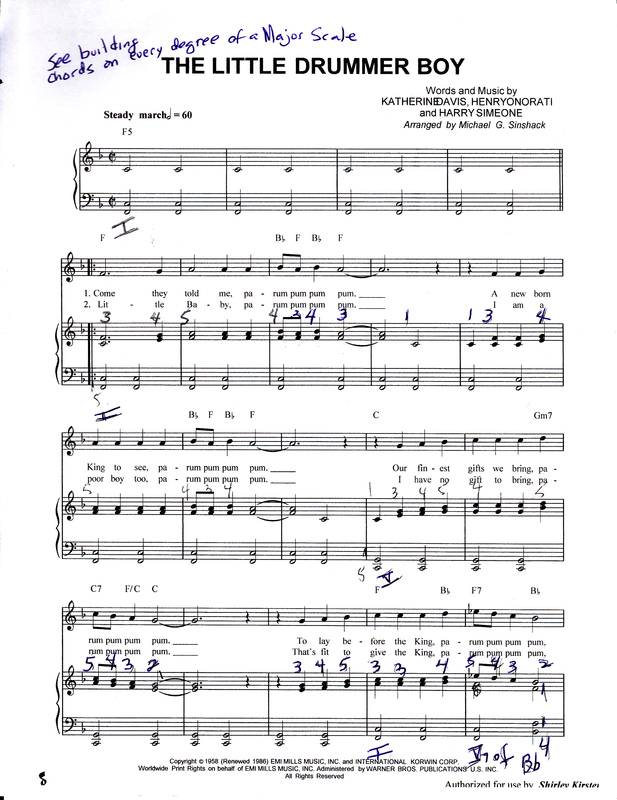 In my Bay Area studios, I’ve assigned “The Little Drummer Boy,” (one of my favorites) along with a Major Scale and Chord Degree Name Sheet. Play though a one-octave C Major scale up and down. My students have had plenty of exposure to Five-finger positions, Major and Parallel minor, so they’ve had an ear-sensitizing jump start. Building chords, and playing through them not just as skips but evolving from steps through five notes is very valuable. The affect or color of Major vs. minor has been “drummed” into most of my students early on as I converted their primer pieces in method books to the parallel minor by lowering the third. (No reason why the method book community can’t detox from MAJOR, MAJOR and more MAJOR in the fixed positions) Or become more CREATIVE! Once my pupils have played chords on each C Major scale degree (1, 3, 5 for Right Hand) (5,3,1, Left Hand) separate hands, they come to chord Vii and “sense” a change or departure from Major and minor. That’s when we discover that lowering what would be a minor Vii by half step on the top note will create DIMINISHED. Students readily appreciate the mood swing. The next part of our exploration in prep for “Drummer Boy,” is labeling the TONIC, Sub-dominant and Dominant chords while PLAYING THEM, of course. 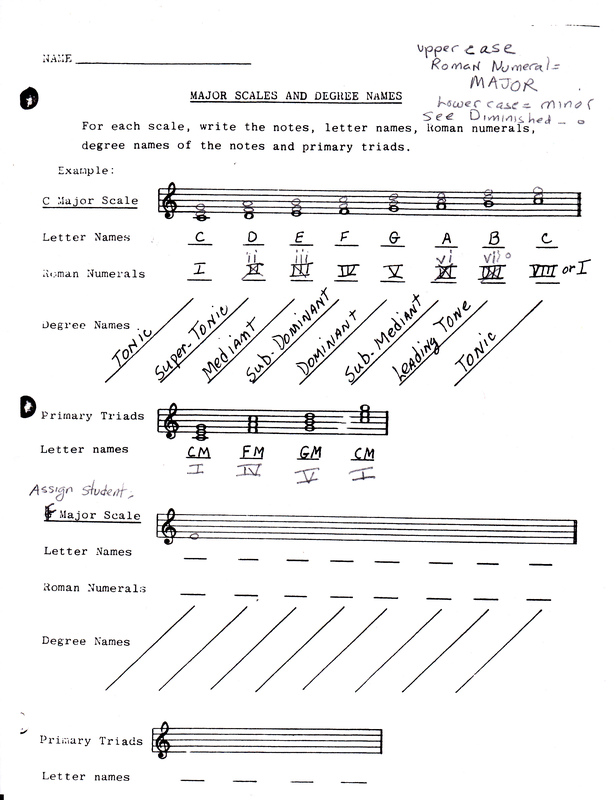 They have already explored EVERY chord on each scale degree identifying Major, Minor or diminished. And yes, they note the labels are Tonic, Supertonic, Mediant, Sub-Dominant, Dominant, Sub-Mediant, Leading Tone, and Tonic. But for this undertaking, I’ve focused on the Primary Chords, I, IV, V and I, having my students jump from I to V and back to I, and then I to IV and back to I.. Not starting with INVERSIONS, which of course make voice leading smoother. “Drummer Boy” will have inversions of primary chords where necessary so this is not overlooked. I show how chords can be inverted. (Scale practice should include inversion of chords) Some students have not found the time to add. But we’re working on it. The one NEW ingredient of “Drummer Boy” that needs to be isolated and integrated into Chord exploration relates to building a DOMINANT on different chords other than what’s primary to the KEY played. 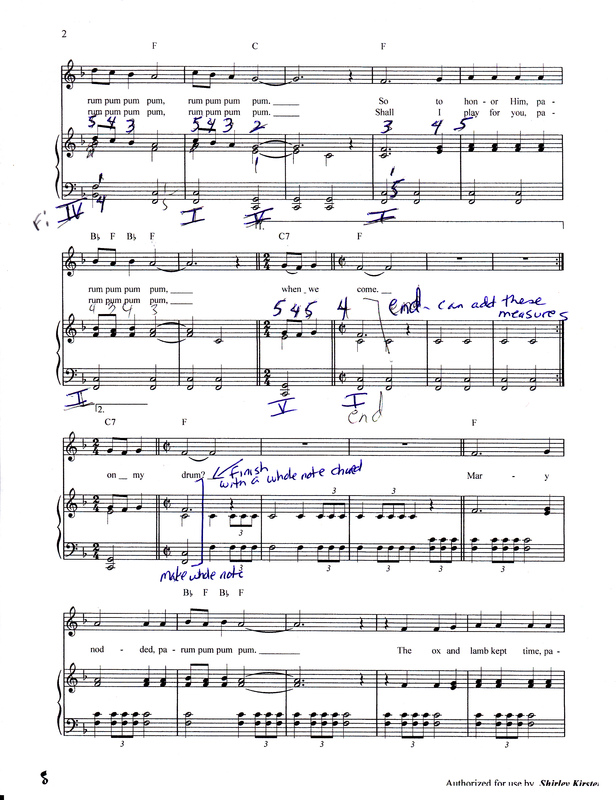 Yes, they’re transposing, but this is nothing new. Students who play five-finger positions and scales, have been transposing for months and years. They then pick out the PRIMARY CHORDS in F Major..
Pupils, by the way, will not be excused from NOTATING chords in F MAJOR. That’s their ASSIGNMENT with plenty of space on the Chord Sheet to follow through during the week. All in all, this piece remains appealing because of its harmonic richness and drum-like, repeated bass pattern. In the last analysis, students love having an orchestra at their fingertips!